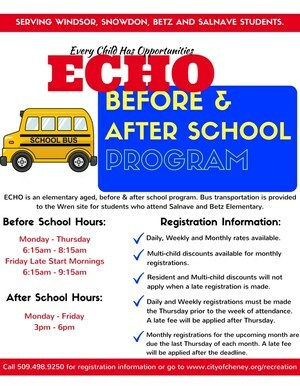 Just a reminder that if inclement weather causes a two hour delay of Cheney School District, ECHO is NOT offered in the mornings. It will run on a normal routine after school. If Cheney School District closes school for dangerous weather conditions, ECHO is NOT offered in the mornings or in the afternoon.